The What: The new Dante interface card for the Eclipse-HX matrix (E-Dante64-HX) from Clear-Com will make its U.S. debut at NAB 2017. The new Dante interface card is compatible with the Eclipse HX-Omega, Median, and Delta matrix systems, supports Dante, and is AES67 compatible, allowing users to transport up to 64 channels of high-quality audio to multiple Dante-enabled devices using standard Ethernet network infrastructure. 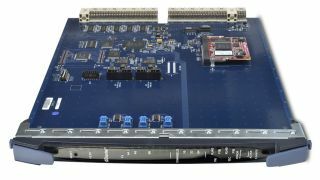 The E-Dante64-HX Interface Card provides Eclipse HX with 16, 32, or 64 channels of low-latency, high-quality AoIP interconnection. It supports all standard sample frequencies for professional use, including a 96kHz/32-channel option. Other features include channel quantity, health, and sample rate indicators; primary and secondary RJ45 or fiber connections; port label data exchange to intercom panel keys; and up to 64 ports per card, with a maximum of seven cards per frame. The What Else: The E-Dante64-HX card provides dual LAN ports for glitch-free redundancy against network failure, allowing Eclipse-HX to retain critical communications without reconfiguring the IP cards in the event of a network outage. The card delivers high audio quality interfacing for Eclipse-HX, and may be used to route IFB feeds to/from a mixing console to provide instruction to on-air talent. If necessary, the card can be readily used in the broadcast chain offering a high quality and low latency transport. Because the Dante devices and the Eclipse HX system are effectively one resilient network, all operators on intercom panels—be it hardware panels, software panels, beltpacks, or mobile apps—can be configured to hear audio from any Dante device. In live sound and live production environments, for example, the scroll assignment feature on Clear-Com’s FreeSpeak II wireless intercom beltpack allows an A1 or A2 operator to choose any assigned channel, monitor, or quickly check the talent’s audio directly from the beltpack, and immediately confirm the audio status to all parties over the intercom. The Bottom Line: According to the company, E-Dante64-HX at 64 ports is the highest available density for a Dante card on the market, offering both primary and backup network interfaces. No license fee required with purchase. The E-Dante64-HX Interface Card will be on display and available for demonstration alongside a range of Clear-Com’s communication solutions, at booth C6908 at NAB 2017, which takes place at the Las Vegas Convention Center from April 24–27. The E-Dante64-HX Interface Card is now shipping.